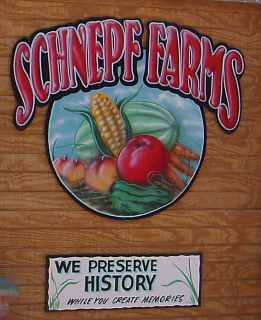 Can you picture yourself at the Schnepf Peach Festival wandering down a dirt path in between green luscious fruit trees filled with apricots and peaches? Remember the taste and texture of the ripe fruit explode in your mouth? Bite into a ripe peach for a zesty snap of mouthwatering goodness. And the smell of ripe fruit is soooo spectacular. There’s nothing quite as wonderful as fresh tree picked fruit. This is the real thing. Picking fruit at the fruit orchards is fun-delicious for the whole family. 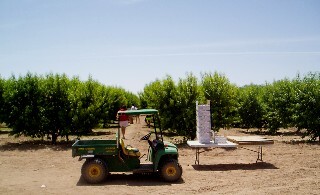 It’s a fun thing to wander down a working grove and look at the various varieties of peaches, especially when you consider the location--in the middle of the Arizona desert. How crazy is that, and fruit trees thrive here! The amazing thing is this place may be like Knott’s Berry Farm was many years ago in Anaheim California. Now there are lots of homes being built and soon the whole area will be a suburb at this rate. So if you want to see rural Arizona before it gets landlocked between subdivisions be sure to visit the farm. The goal of the farm is to preserve history "while you create memories." Sneak a glance at other people eating fruit and you just might catch them with a huge smile on their faces and juice dripping on their chins. These are the memories that will make you feel good. 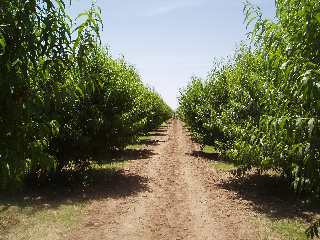 Even though there was a frost in the spring ‘07 there were lots of peaches and apricots to pick in the groves. 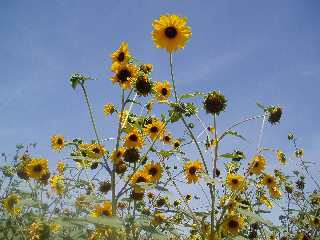 Just head straight back past the vegetable garden and sunflowers and park. A crew member will give you a bag for apricots or box for peaches. A box for peaches is recommended because the fruit is picked very fresh. You want it to stay that way. Get and box and start peach picking! We picked a bunch of apricots and peaches and you can also buy them pre-picked at the store. Keep in mind these are very ripe so if you cannot eat them right away they will spoil fast. 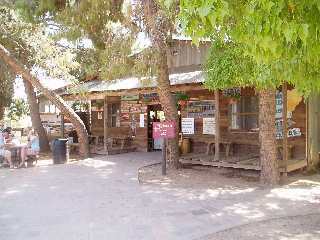 The store has lots of good things to eat and there are picnic tables outside. So you can sit down under some cool tree shade, and snarf down the fruit in comfort. The peach picking season generally runs in the spring from the end of April until mid-June depending on weather and crops. For details go to their website at Schnepf Farms or call ahead to check hours etc. at their phone: (480) 987-3100.